Choreographic research about identity through a collective self-portrait. Five faces, in continuous movement, build up a fiction to narrate the evolution of a body. The work shows a panoramic vision of individual thought that is revealed in hand to hand encounters. Canvas of Bodies, by Taiat Dansa, offers a landscape based on the differences among the five dancers. Differences in thinking, in attitude, in behavior and skills. This work is a choreographic composition that stresses difference, and questions the concept of beauty, perfection and virtuosity, debatable values in art and in contemporary dance. Five dancers build up this choreographic canvas in a sort of self-portrait both individual and collective. 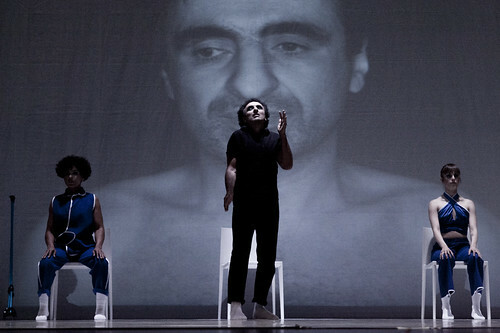 Idea and Stage Direction: Meritxell Barberá and Inma García (Taiat Dansa). Choreography: Taiat Dansa in collaboration with dancers. 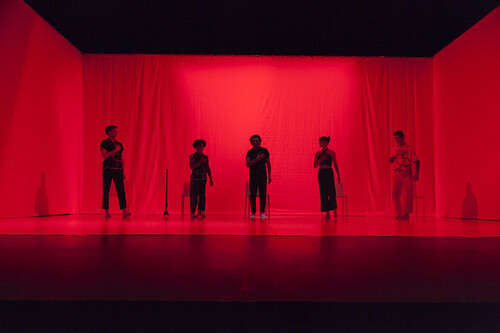 Dancers: Dan Daw, Saïd Gharbi, Cora Panizza, Martxel Rodríguez and Laila White. Photography and Visual Editing: Marta Fernández. Stage Design: Taiat Dansa y Yapadú. Translation and Subtitles: Gloria Pitarch. Distribution: Teresa de Juan (TdJ Producciones).